After making this dish, I have seriously thought that my blog should be named supermaket chef or something so. (don't know if anyone owns it though). See, I get most- if not ALL my ingredients from the supermarket. I rarely go to the wet market. The number of times I've visited the wet market can be counted using the fingers of 1 hand. Why? Because the grocery carries everything, and if you know where to go or how to judge fresh produce, what you get is as good as or even better than the wet market stuff. And talk about the convenience of the shopping cart, air-conditioned spacious aisle, credit cards (not to mention credit card promos! )- and these are just to name a few. 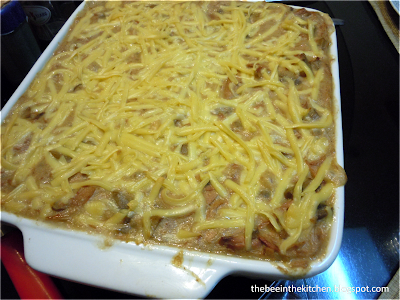 This tuna casserole holds like a pie, layers like a lasagna, and is as creamy as your alfredo =) try it! Try it out! get recipe after the jump! 1. Saute onions until translucent and limp using excess oil from tuna. 2. Add in the mushroom and tuna. Try to mash the tuna as you stir, for smoother consistency later on. 3. Add in soup and cream, mix until dissolved. 4. Add water. Add a bit more if needed. 6. Line the bottom of a square baking dish with 6 pcs skyflakes. 9. Bake at a pre-heated oven for about 45 minutes or until cheese changes color. Note* if served too hot, tendency is for the sauce to be too runny. thus, the lack of sliced pictures because it was devoured instantly. did this actually during one of the no-meat fridays of lent :) it's awesome, and leftovers can still be used for pasta.